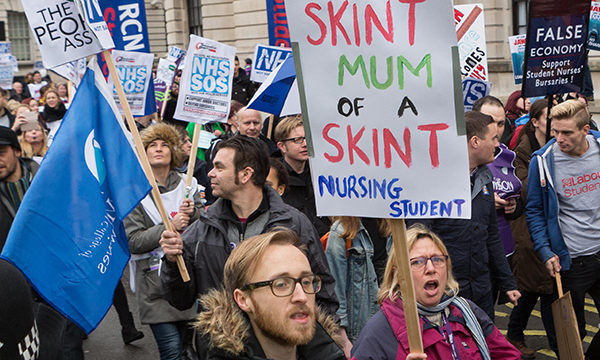 Give nursing students £5,200 a year in grants and nurses a pay rise to address the workforce crisis, health think tanks have urged. Student grants are one measure they recommend to prevent a looming shortfall of 108,000 nurses in the NHS over the next decade. Undergraduates receive an annual cost-of-living grant in addition to the means-tested loans they currently receive. The authors say this would address financial worries that deter people from embarking on nursing degrees and lead students to quit their studies. The authors say these measures would help attract 5,000 more undergraduate and postgraduate students to nursing courses each year until 2021, and reduce course drop-out rates by a third. The report also calls for pay rises to retain existing nurses. The authors acknowledged that the Agenda for Change pay increase introduced last year in England had improved staff morale, but warned this might not last. ‘This can quickly be undone if pay growth stalls beyond the end of the current settlement period,’ the report states. With the Agenda for Change deal expiring in 2021, the report recommends a 1% pay increase from 2021-22. Targeted pay increases, loan write-offs, and ‘golden hellos’ for mental health and learning disability nurses, are also recommended by the authors. RCN acting general secretary Dame Donna Kinnair urged the government to consider the report carefully. ‘The staggering numbers in this report should cause alarm in Whitehall and focus ministers' minds on the cash they must put on the table to close the gaps,’ she said.